Fishing around Sooke continues to be a bit spotty. 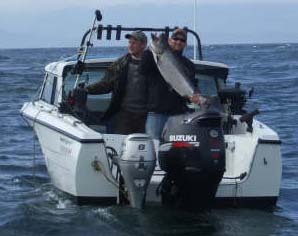 There's some big Vancouver Island beauties being weighed in, but also quite a few reports of slow days. The bad weather in the past week has not helped, with a few windy days cutting short the fishing efforts. Otter Point is reported as a best bet for catching a spring, although there are also a fair number of reports of salmon caught at Secretary Island. This 16 lb chinook caught off Otter Point by Hazen Price last Monday -- way to go! 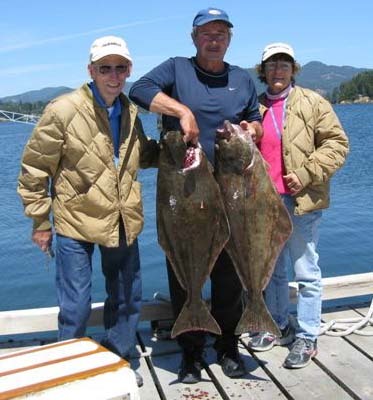 Mark from Footloose Charters caught two halibut while fishing for salmon between Muir Creek and Third rock with some guests from New Hampshire staying at Salty Towers. They also caught a 22 pound chinook off Secretary Island. 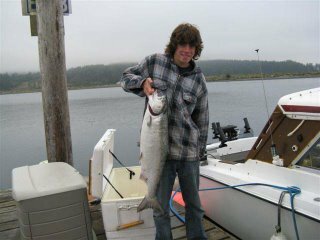 Ryan from Fresh Fishin' Charters sent in the photo below of a nice spring salmon caught recently.